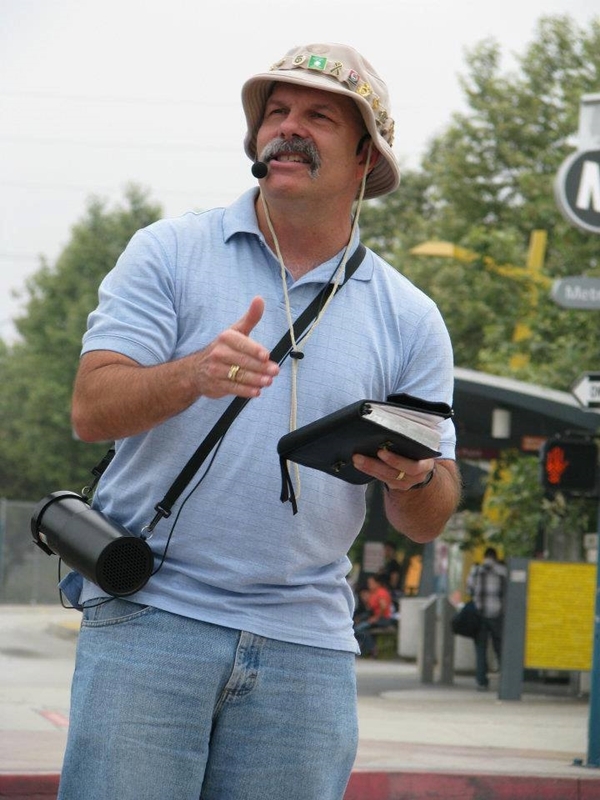 Tony Miano, a US preacher and a former Los Angeles Deputy Sheriff, was arrested yesterday (8th January) and remanded in custody to appear before Dundee Sheriff Court at 10am today. He was part of a street preaching team holding a week-long mission in Scotland. He was the second of the street pastors to address lunchtime shoppers in Dundee High Street. He talked about the nature of sin; about the different sins that Jesus had come to save people from when a woman began to shout at him. He was preaching about sin in general and when he mentioned sexual sin including adultery, promiscuity and homosexual practice, the woman shouted that her son was gay. He says the first woman then appeared to be calling the police on her mobile just as a council warden came along and said that while we were doing nothing wrong, and had the right to free speech, we should move on. Mr. Miano finished his preaching in a few minutes and as the street preachers packed up two police officers arrived. At this point Pastor Williamson says the women shouted that they would get the preachers arrested. “The female officer saw we had a camera and lunged for it and then the male policeman grabbed it and threw it in the police van,” says Pastor Williamson. He says the male officer interviewed the women and then immediately arrested Mr. Miano, but did not question him or explain why he was being arrested. “After Tony was put in the police van I asked why he was being arrested and was told it was for a breach of the peace and for using homophobic language,” says Josh Williamson. Andrea Minichiello Williams, Chief Executive of the Christian Legal Centre, says the incident raises serious questions about police procedure and understanding of the law in dealing with such incidents. “This appears to be an overzealous reaction by the police. The incident, adds to the number of arrests of Christian street evangelists for preaching from the Bible. It is indicative of the suppression of the freedom to speak and live out the words of Jesus Christ in public and present the teachings of the Bible,” says Andrea. She adds that the Christian Legal Centre is ready to serve anyone who is challenged for expressing their Christian beliefs. Tony Miano was arrested in July last year, in London, for alleged ‘homophobic’ comments. The case was dropped. He has been remanded in custody to appear before Dundee Sheriff’s Court today (9th January) at 10am.